I just renewed my domain name and blog site. This means I have been WordPress blogging for a whole year. Happy first birthday Busted Flip Flops! These flip flops have been seriously busted lately. I haven’t written all month. Certain instances and situations have occurred which have kept me away. But I was never truly away. Not in the spiritual sense anyway. It actually feels weird to sit here and write. How I have missed it. I am feeling a little rusty like my bicycle chain. But I can still pedal. Although a little creakily at first. There are so many things I want to write about but for now I just want to say thank you to all my readers. I have enjoyed your presence and comments and inspiration. I have enjoyed reading and connecting with my favorite bloggers and entering into this WordPress world that has so many times brought sunshine to my flippity flop walk on the rocky beach. So cheers to this first birthday! Let us raise a glass. Savor the sweetness of the written word and let it permeate a moment and blossom into its full-bodied flavor. 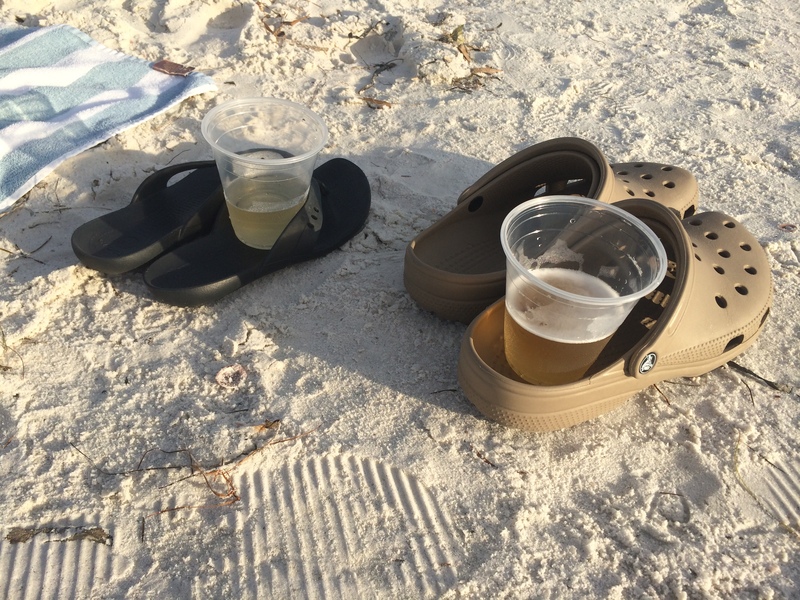 And walk along side me for another year, busted flip flop to busted Croc (or your footwear of choice). Well happy birthday. :0) Hope you have a great year to come! Thanks, Ron. Your readership and friendship is mucho appreciated!! I’M about a year late, but congratulations on your Year One WordPress anniversary. I just had my Sixth Month ‘anniversary,’ and still feel like an infant (a six month old one) living in the general blogosphere and cyber media world. I hope you continue writing here for a long, long time! And DAMN those flip flops and beer on the sand look so good! There’s no better place (and feeling) for me than what that photo captured. Recline on!